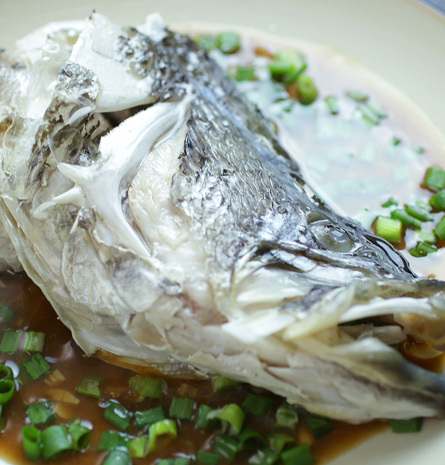 Marinate barramundi fish head with Hua Tiao or rice wine, salt, and white pepper for 20 minutes. Steam fish head for 8 - 10 minutes (adjust to preference). Pour sauce onto a serving plate. Add chopped spring onions on top of sauce. 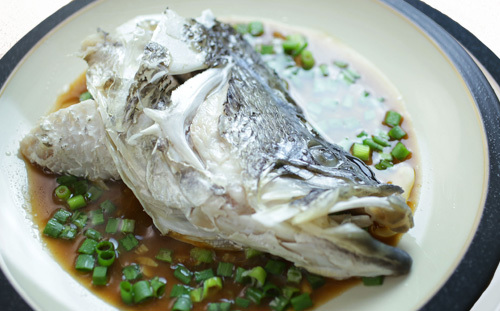 Remove barramundi fish head from steamer and plate on top of sauce. Finish by drizzling hot peanut oil over fish head. In a sauce pot, mix water, Tau Chu, minced garlic, Hua Tiao or rice wine, oyster sauce, and sugar.